Free tea and cocoa tasting with live Christmas music from your's truly. 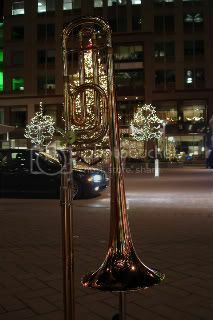 Come out and hear me play some Christmas Carols on my Trombone! MARGARET CHO will be appearing at The Carolina Theatre of Durham on Friday, Nov. 19. (8:00 PM). My chorus has been invited to "back her up" on one number! She apparently includes singing in her acts now. On Saturday, Nov 13th from 9am - 12pm.The Wake County Animal Shelter will be holding an Adoption Event at McDonalds McCafe at the intersection of Falls of the Neuse and Spring Forest Road in Raleigh. There will be live music at Electric Beanz Coffee Bar tonight (Fri 11/12) (The same place we had out meetup last month). The Band is Fusion Collective South. Plays from 7-9pm. They will also have art displayed tonight as part of the Fuquay / Holly Srpings 2nd Friday Art Walk. For those of you with kids, you might want to check this out. Nov 20, they'll have the usual tree light ceremony and have a train ride as well as ice skating. Sounds like lots of fun for kids. I've been to a couple of them and they always do a nice job!